Day two starts much earlier, after a rough night. The unbearable heat was taking on everyone around and staying in a boiling tent was no option.Good thing to find a bit of shadow or take a walk back and forth to avoid insanity to increase. It is not for long that the smell of glowing coal, roasting beef and beer is filling the air again, even in the morning. Today’s first band is unknown to us and after learning that Dr. Living Death happens to be a bunch of masked guys with queer clothing it does not seem that we missed the big thing. Andy and Chris rocking in the afternoon sun! Up next is one of Germany’s most promising Rock’n’Roll outcomes. 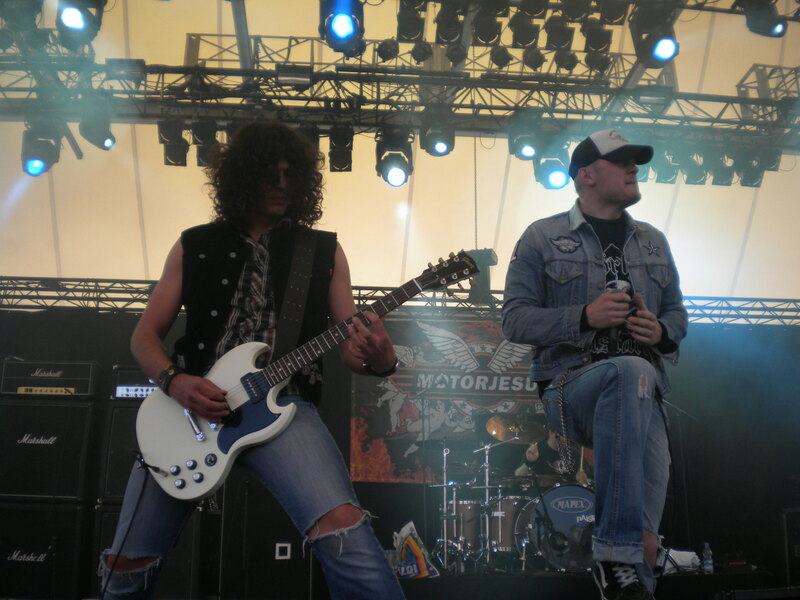 The quintet, formerly known as the Shitheadz plays a raunchy blending of classic Hard Rock and elements from several Metal genres, such as Heavy, Southern, Stoner and whatever suitable Andy Peters (Guitars), Chris “Howling” Birx (Vocals), Guido Reuss (Guitars), Roman Jasiczak (Bass) and Oliver Beck (Drums) come across. With Motorjesus hitting the stage today Rock Hard once more proves to be a truly fan committed event, if you consider the fact that a petition initiated by fans and bought to our colleagues at The-Pit.de, finally entering the Rock Hard office in Dortmund indeed is amazing. And as for us, we also say “thank you!” to everyone in charge for putting together the billing of RHF 2012 and for bringing this awesome live act to Gelsenkirchen. For those of you how have visited this rock gathering before surely noticed that hardly ever before has it been as crowed at about two in the afternoon on the second day as it is during the Motorjesus set. 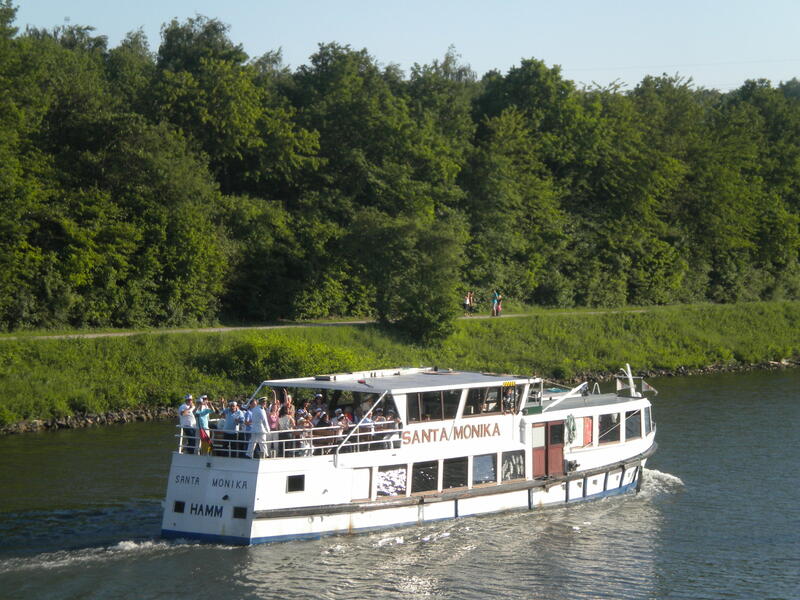 The first trace of stragefreight passes within seconds as musicians and spectators emerge into one forceful unity, partying as if there was no tomorrow. 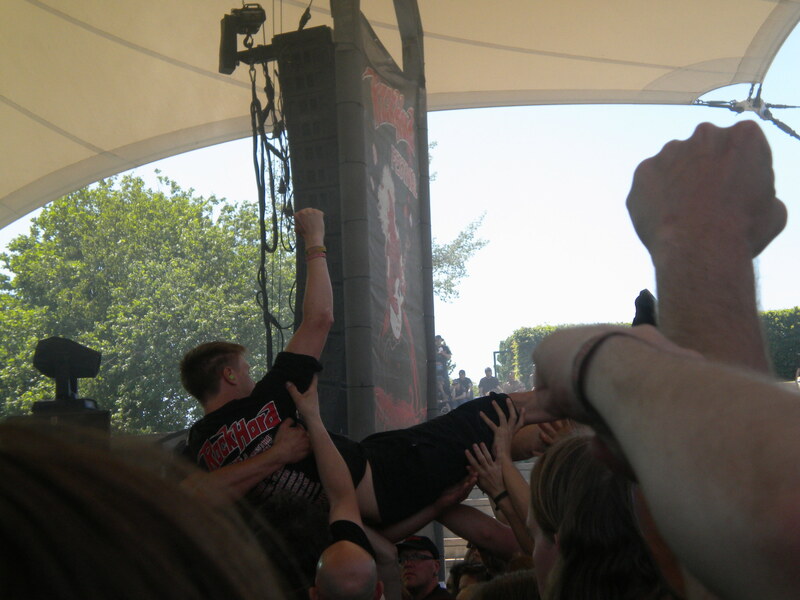 To share even more of the rock spirit among their fans, vocalist Chris arrives with a plastic bag full of beer and booze he throws into the thirsty masses. As it might be a once-in-a-lifetime chance the Mönchengladbach based band presents a roundup of everything they have released so far, from the first albums “Dirty Pounding Gasoline” (2004) and “Deathrider” (2006), the “100.000 Volt Survivor EP” (2009) all the way to their still current output “WHEELS OF PURGATORY” (2010). The sing-along potential of many songs with their catchy melodies is reflected by all the voices in front of the stage and each of the guys was clearly happy to notice that something they created could cause such reactions. 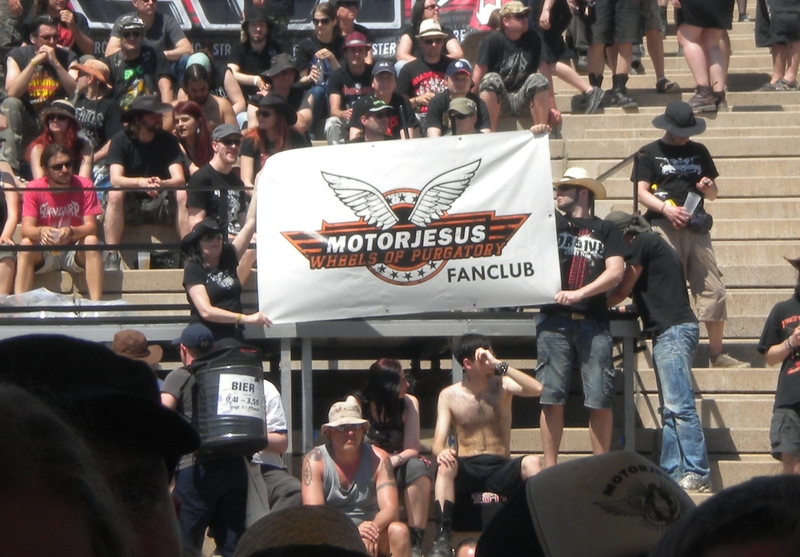 To top any expectations Motorjesus might have had concerning taking part in the Rock Hard adventure, their very own fan club presents a banner to the band, while they are playing. Oh yeah, this is one big happy Metal family! After this brilliant show with Portrait and Hell next in line, lunch calls again and in the cause of the afternoon the sun finally takes its toll on me and an extended break is inevitable. Therefore my co-worker takes over business for the next couple of hours. 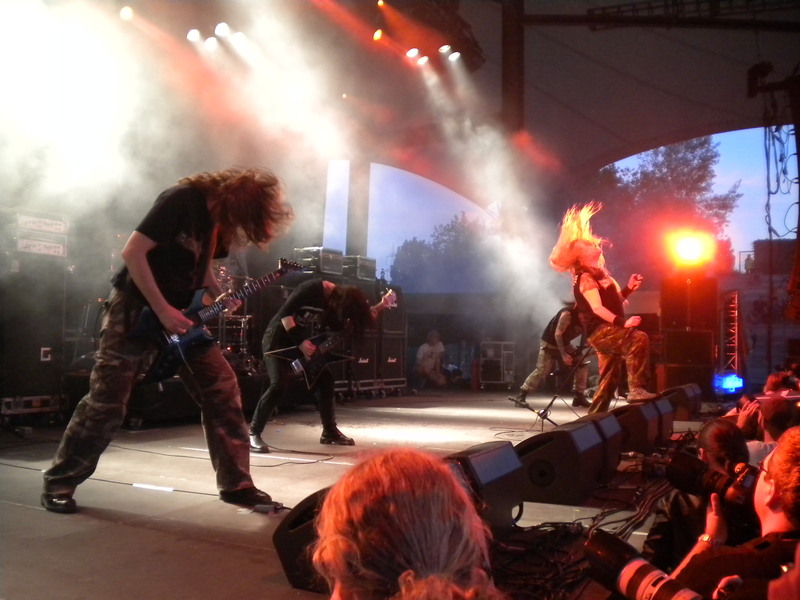 Headlining the second night, British Death Metal detachment Bolt Thrower literally explode at first light. Starting the bombardment with “Contact – Wait Out” from 2003’s” Honour Valour Pride” album, the band delivers oldschool neck-breakers as well as the “newer” classics from the last album, “Those Once Loyal”. The first song remains the only one from the short era with Dave Ingram on vocals, but there’s so much classic material in the back-catalog that it’s impossible to perform each and every masterpiece this band has ever written on one single night. “Mercenary”, “World Eater”, “Cenotaph”, you name it, they play it! When Karl asked Where Next…? he doesn’t have to wait for an answer as thousands of fans scream back at him at once. Gavin and Barry open Salvo after Salvo, backed up by the sturdy bass lines of Jo Bench, who is still going strong as an icon to almost every woman who’s into nowadays heavy music. The encore of course includes “No Guts, No Glory”, which Karl introduces as a song dedicated especially to the über-loyal German fans. When the Cannons finally began to Fade, the band leaves nothing but scorched earth and a depleted, but nonetheless happy audience. 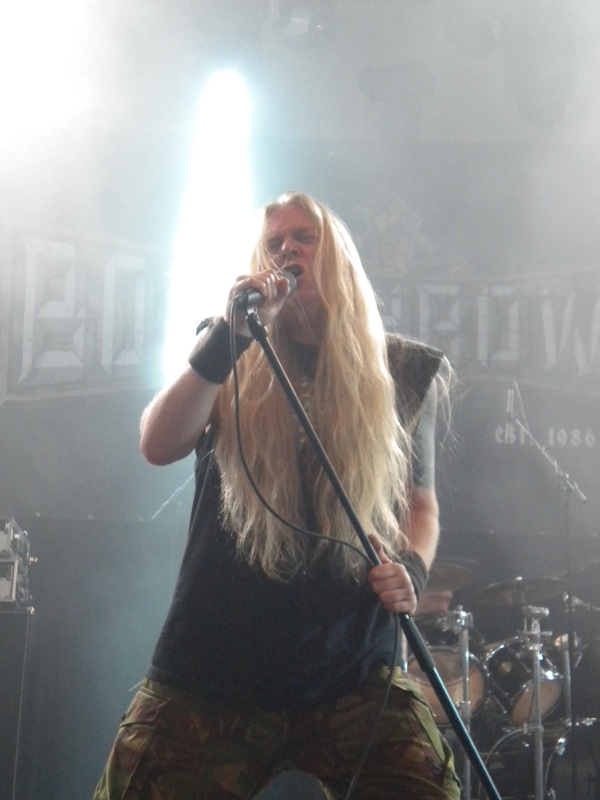 A little random trivia: After a large number of fans asked about Bolt Thrower merch, RockHard editor-in-chief Götz Kühnemund had to inform them and everybody else that it`s going to arrive with the band and will be sold in a separate booth. No surprise that most shirts were gone already an hour or two after the sale officially opened.